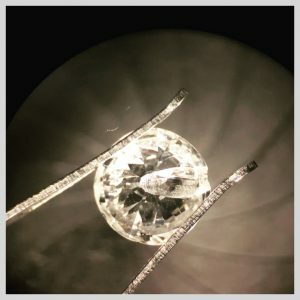 28 Aug Diamonds can chip! 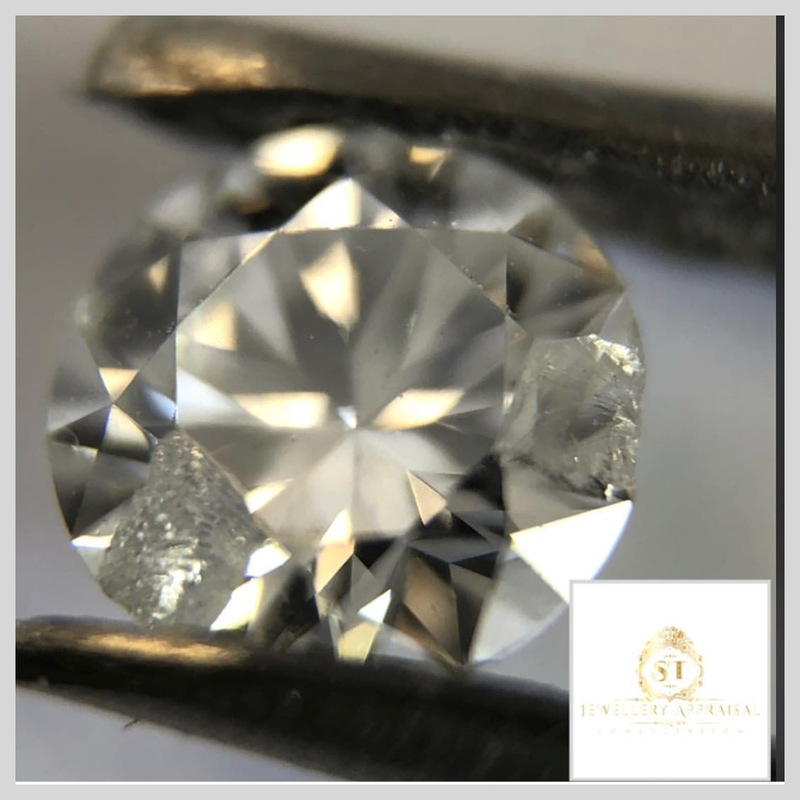 I often see chipped diamonds come through the appraisal lab. In multi diamond set pieces I might find one or possibly more chipped stones. It is quite common! Many clients are surprised to learn that diamonds can chip! Isn’t a diamond the hardest substance in the world? Yes it is! Hardness refers to resistance against scratches and abrasions. 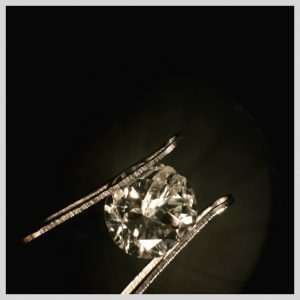 Toughness is another measure of durability and diamonds aren’t as tough as we would think. Diamonds can chip or fracture from hard impact. If the impact occurs in an area where the carbon atoms are not tightly bonded you may end up with a chip. Areas of atomic weakness are called cleavage planes. The majority of chipped diamonds I see are set in rings or bracelets. Rings and bracelets tend to have the most impact with surfaces during wear. Earrings and pendants are generally safe from chipping unless the item is dropped or stored incorrectly. This doesn’t mean you should put your diamond jewellery back in the box and wear it less often. 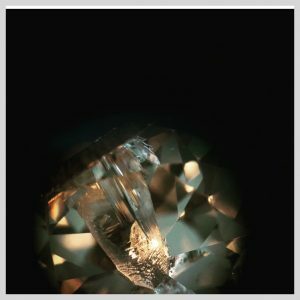 There are some things you can do to avoid damaging your beautiful diamonds. 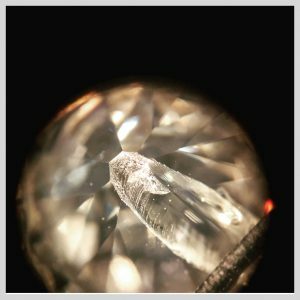 The following images you will find in this post were provided to me by gemology student and GIA alumni Adrianne Sanogo from the greater Philadelphia area. The images are of her own personal diamond ring that was dropped and hit a metal shelf. She has allowed me to share them with you. It truly can happen to anyone! Accidents happen! If you have insurance on your jewellery, check to see if your policy covers chipped or broken diamonds. Some companies will not cover damage and others will depending on the circumstance. This first image shows us the pavilion of the diamond (bottom of the diamond). We can see the diamond would have been struck from the girdle (side edge). The chip then extends all the way down to the culet (bottom point). Diamonds are commonly hit at the girdle which is usually exposed between claws. Diamonds are less likely to chip in bezel settings because the girdle isn’t exposed. Again we are looking at the bottom view of the diamond. In this image you can actually see the place of impact. Notice the indent in the girdle. A view from the top of the diamond looking down through the table.